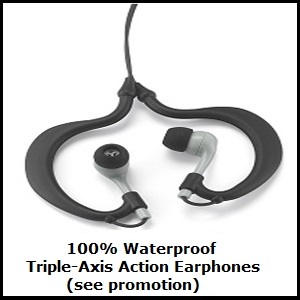 "World's Smallest Waterproof MP3 Player"
USB), Enhanced Neodynium 10mm Earphones. 2013 Update: Product was tested by SWIMMER, the Official Magazine of US Master Swimming, along with other Swim MP3's available on the market. 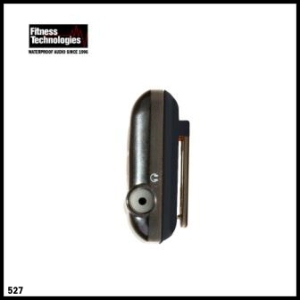 SWIMMER reported: " This (UwaterG4) lightweight, easy-to-use unit was a hit with testers...the sound quality is excellent, with a nice full bass..with 4 GB of storage, this was a tester favorite" (Jan/Feb 2013 Vol 9 issue). Player comes with new Earphones, new ear-tips, and new USB cable. 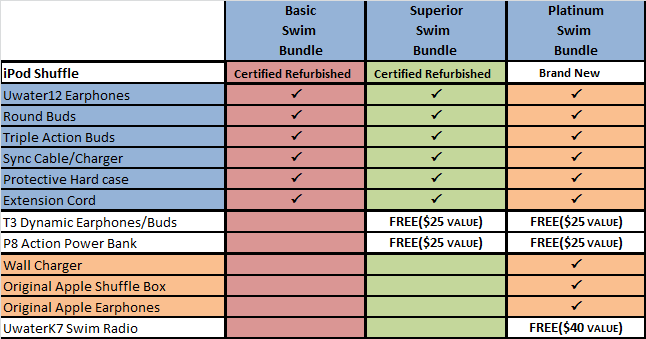 Player is backed by the same refund / warranty terms as a brand new Player. 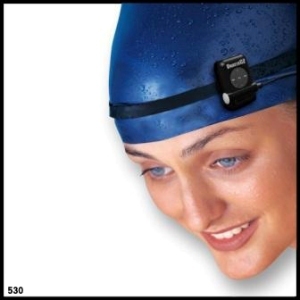 This 4 GB micro-sized MP3 best seller player (the smallest you have ever seen) clips onto goggles or fastens onto headband, armband, or belt for swim-anywhere, go-anywhere, sweat anywhere listening pleasure. End forever the boredom of lap swimming or just enjoy the novelty of hearing music and audio books in the water, on the beach, while surfing, scuba diving, skiing, sailing, exercising showering, outdoors walking, running, any activity! The UwaterG4 audio is tuned to cut through the noise of splashing water and bring you only the purity of ultra clear stereo sound. Our newly designed single port 3.5 mm copper plated earphones/USB jack connection completely seals water out plus provides crucial long term protection against corrosion, a problem which might damage other devices with regular jacks. 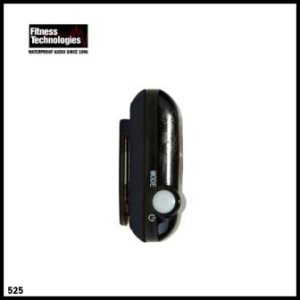 Fitness Technologies has been the USA#1 provider of waterproof electronics for enhancing active lifestyles since 1996. Our Waterproof Audio Technologies (WAT) were featured in the New York Times, LA Times, Men's Health (Europe), Swim World, Fitness Swimmer, Triathlete Magazine, CNET, CBS TV, as well as over 30 other publications (see "Uwater in the media"). Selected by SWIMMER Magazine as "tester favorite". Also endorsed by the US National Sporting Goods Association. Designed in the USA. Patent Pending. -- Play Time: Continuous 6-8 HRS. -- Weight: Under 1 Ounce. -- Highly Visible Multi-Color LED Mode Control. -- Easy downloading from your iTunes library. Do not be fooled by cheap imitations. They won't last beyond your first lap. Since 1996 our engineers have invested years of R&D on improving Waterproof Audio Technologies (WAT), optimizing in-the-water audio reception, tuning and controls. 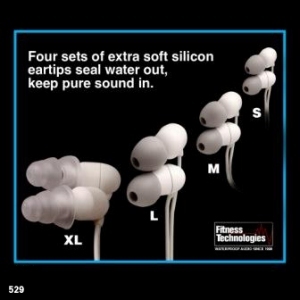 Make sure that your waterproof audio gear is one of our trademarked brands: UwaterG2, UwaterG4, UwaterG4X, UwaterK7, UwaterK8, UwaterT3,from Fitness Technologies Inc. Thank you for your interest in this Innovation. This is an absolute product for those who enjoy music in every activity. You can just use it anywhere anytime. 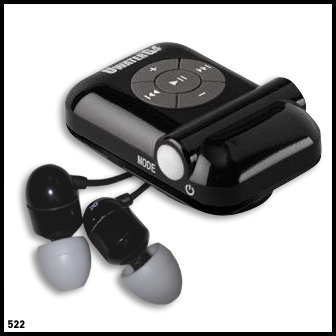 This MP3 player is lightweight which makes it easy to carry anywhere and absolutely water proof. It is easy to upload music too, just drag and drop. And easy to use controls. I totally recommend this product. 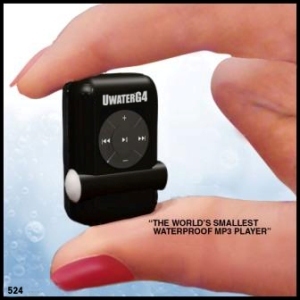 If you’re a serious, regular swimmer and you’re looking to break the dull monotony of laps with music, the best waterproof MP3 player is UwaterG4. US Masters Swimmer reported UWaterG4 as lightweight, easy-to-use unit and is a hit with testers...the sound quality is excellent, with a nice full bass… with 4GB of storage, this was a tester favorite. After buying the product I totally agree with them. The sound quality is very good and the earphones are never a distraction! !